The Scallop Shell bedding set in White by C&F Enterprises will sweep you away to the sea in comfort and style. 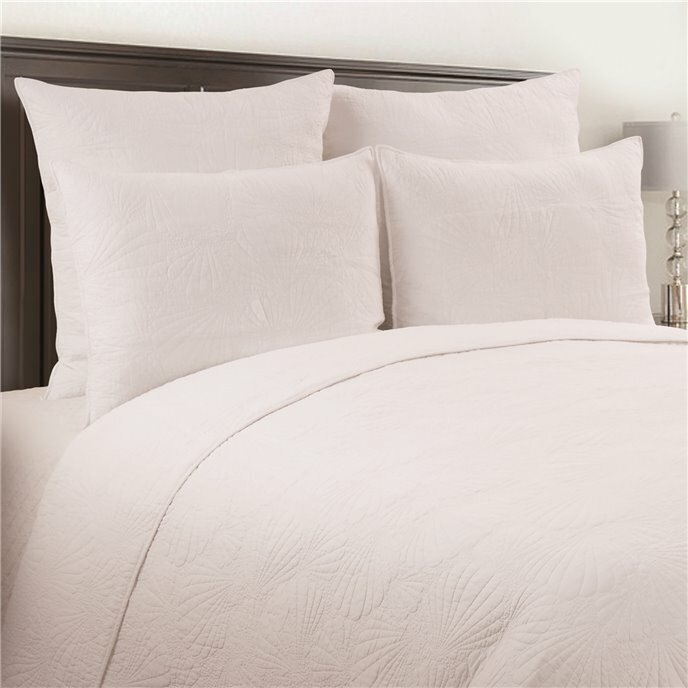 The crisp white color and beautiful scalloped shell quilting pattern are a perfect mix of trendy and subtle. This collection is machine washable for easy care and 100% cotton. Mix and match your favorite accent pillows, throw blankets, and window treatments for your own custom look. Made by C&F Enterprises. Slumber under the sea with C&F Home's Scallop Shell quilt set. With scallop shell designs quilted in, the ocean atmosphere is always close. Available in seafoam, coral, green, and white colorways the Scallop Shell quilt is perfect for mixing and matching with your coastal decor or on its own paired with your favorite accent pillows. Crafted of 100-percent cotton this quilt set is machine washable for easy care. Coordinating euro shams available separately. 1 King Quilt and 2 King Shams, Measurements: Quilt 108" x 92"; Sham 20" x 36" , Quilted Scallop Shell Design, Coordinating Euro Shams Available Separately, Face 100% Cotton, Fill Material Polyester/Cotton Blend, Machine Wash Cold, Line Dry, Imported. Made by C&F Enterprises. Slumber under the sea with C&F Home's Scallop Shell euro sham. With scallop shell designs quilted in, the ocean atmosphere is always close. Available in seafoam, coral, green, and white colorways the Scallop Shell euro sham is perfect for mixing and matching with your coastal decor or on its own paired with your favorite accent pillows. Crafted of 100-percent cotton this euro sham is machine washable for easy care. Coordinating quilt set available separately. Measures 26" x 26", Quilted Scallop Shell Design, Coordinating Quilt Set Available Separately, Face 100% Cotton, Fill Material Polyester/Cotton, Machine Wash Cold, Line Dry, Imported. Made by C&F Enterprises.